MyPhotographysite: Gmail Logout Page describes that the user can now add multiple gmail accounts. Gmail Logout Page describes that the user can now add multiple gmail accounts. 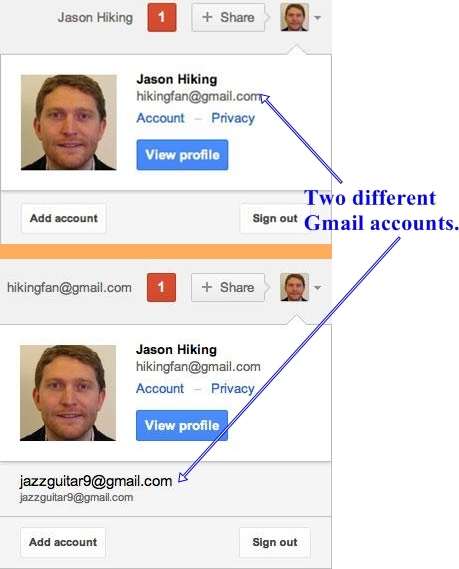 The two different Gmail accounts are shown in this image below. Right now, there is a provision to add only Gmail accounts and users will be delighted to use this feature as it will really save the login and logout actions. It will be interesting to use this feature if any Google account addition is allowed. All in all, this feature will certainly offer fast paced account access as the user could add multiple accounts. Hence, Google should look forward and design this feature so that any type of Google account can be added so those users don’t need to logout to switch between the accounts. At last this attempt by Google is outstanding and we hope they will allow the users to add any type of Google accounts in future. Is this a test feature at the moment? It looks really promising, I have been eagerly waiting for this. Hope they bring out this feature in the very near future. Thank you Debopam and Saurav for reading my post. Hey! I liked your article! it was something new! And now I would surely follow your advice! I think your blog is really informative and creative!